BEVERLY HILLS, Calif. -- NBC is betting on "Will & Grace." The network has already ordered a second season of the show, even though the first season of the revival won't air until Sept. 28. NBC Entertainment Chairman Robert Greenblatt told a TV critics' meeting Thursday that a deal had been made. Greenblatt cited an "outpouring of love" from fans of the original series in announcing the second season. He said he was glad to have the show on for a minimum of two years, opening the door to more. The cast reunited for a special election-themed online episode in September 2016, 10 years after the series wrapped. The NBC executive appeared with returning cast members Debra Messing, Eric McCormack, Sean Hayes and Megan Mullally. 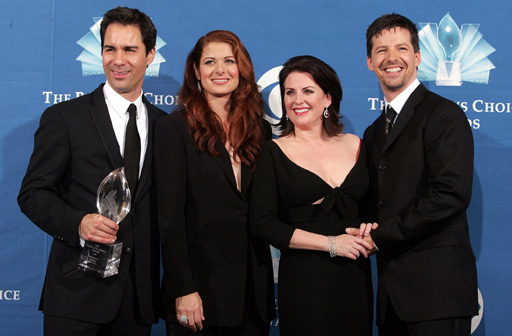 Co-creators Max Mutchnick and David Kohan are back as producers of the "Will & Grace" reboot. The first season will include 10 episodes to air in 2017 and 2018. The original, Emmy-winning series aired from 1998 to 2006. Larry Mitchell Hopkins, who is believed to be a member of an armed group that has detained? Central American families near the U.S.-Mexico border was arrested Saturday in a border community on a criminal complaint accusing him of being a felon in possession of firearms and ammunition, authorities said.